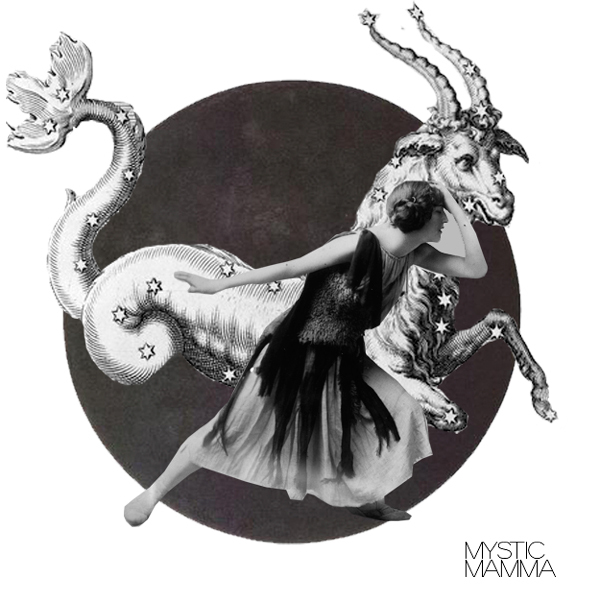 First *NEW MOON* of 2016 is in Earthy Capricorn. She’s calling us to reach for our dreams and ground them into the physical plane, but reminds us that we must first embody our knowing. For that is where our truth and nectar lies. The wisdom, the insights, and the understanding we receive are to be embodied within each one of us. While many are eager to share and teach what they learn as soon as they receive it, that is not what is being called of us. We are to live with and practice what we are learning and that should be our central focus, our locus of devotion. For as we know, it’s not about trying to change the world “out there” but about turning the focus within, grounding our roots into Mamma Earth and humbling ourselves to the greater journey of Creation, which is all about growth. So on this NEW MOON in Capricorn, it’s time to deepen our roots and abide with all that is circling in our present Reality. Like the goat, we can climb the mountain toward our dreams, slow and steady, remembering to take good care of ourselves along the way, while taking the time to enjoy the view. “Think of a solitary mountain goat, deftly leaping from stone to stone, in the high altitudes, while below, lies the vast snowy theater of the world. “This New Moon become the goat. And let your life be the breath-taking, intricate, and treacherous mountain. Your focus? Keeping your balance, of course! “According to the Austrian philosopher-clairvoyant Rudolf Steiner, balance is the psycho-physical sense we must develop in Capricorn. “When we steady ourselves, we steady the world. If we slip and free fall, the world goes spinning. “The alliance you forge with Capricorn now can strengthen your footing for the entire year. Capricorn is a climber, inspired by high goals. “But nothing is gained without first achieving balance on the terrain immediately beneath your feet. “In preparation for this first New Moon of 2016, the Capricorn Sun and Moon re-activate the powerful energies of the Pluto/Uranus square that occurred 7 times between 2012 and 2015. “…Issues of Freedom vs. Power will be back on view—where do we give away our power and loose our freedoms and where do we need to step into our freedom and channel our power? “Whenever another planet transits the degrees of these ongoing outer-planet aspects, it raises those issues again, just to see if we’re paying attention. “It provides a mirror to see how we’re balancing the energies—if we take one side, you can be sure we’ll project the other side onto someone else. “It takes humility to accept that we might be part of the problem facing us, even when we’re doing our work. Especially if we’re doing our work! “Capricorn is the sign of our dharma—behaviors that are considered to be in accord with the order that makes life and universe possible and includes duties, rights, laws, conduct, virtues and ‘right way of living’’. “As we can see and no longer ignore, our governing structures (another Capricorn function) are no longer aligned with cosmic law. We have fallen out of balance. “And that makes it imperative that each of us (Uranus in Aries) assumes our dharma—our role in the social order. We are called to bring our strengths, visions and talents into society for its healing and advancement. “Capricorn gives us the motivation and strength, self-reliance and endurance to overcome obstacles and meet the tests life raises for us. “Venus conjunct Saturn is perfect for financial management so if money has been an issue, now may be the time to get things in order and under control again. “It’s about dealing with adult responsibilities but again, this isn’t a bad thing. Dealing with real world issues is part of growing up, part of feeling in control of our lives. “The Moon is trine to Jupiter along with the North Node so this tells us that there will be benefits further down the line but we have to wait for them to manifest. We can’t have it all now, however much we want it. “It’s about doing the work on a consistent basis, being persistent and knowing there aren’t any short-cuts to that Jupiter bounty. “We’ve got to go the long way round, sometimes even backtracking (like Mercury), covering old ground to ensure we know what we are doing and filling potholes. “The Moon is also sextile Chiron so this is an opportunity to discover weak points. Those weaknesses are shown by the house where Chiron is transiting. “It’s time to step into your authority but also to recognize that some things are out of your control. Instead of beating your head against obstacles, engage with Uranus and see if there is a new way of approaching things. “In the long run, facing our own limitations and uncertainty can make us more sure of our direction, firming foundations and strengthening resolve. “Dealing with what’s making us stressed (Uranus) will free up energy to put towards climbing our own personal mountain. “..this month and the month of June are HUGE in terms of growth, expansion and opportunities coming into our lives for inner work as well as being of service to the world. “The New Moon trines both bodies in earth signs shows that what we set into motion right now has amazing potential behind it to grow deep roots as well as reach high into the sky. “The Uranus/Pluto square is no longer exact but they are still traveling close together and they are still bringing in shake ups and wake up calls, breakdowns and breakthroughs. “With Black Moon Lilith in Libra involved the evolutionary and revolutionary energy is permeating relationships in our lives as well as structures and traditions that are old paradigm and need to be taken down. “This can be amazingly freeing and liberating, but it can also be anxiety producing and unnerving as things we are holding onto that are no longer good for us can be snatched away by the Universe right now. “With the New Moon conjunct Pluto, square Uranus and square BML- we have a powerful force of energy for evolution or destruction- and it’s up to us how we use it. “The New Moon in Capricorn helps us to set new foundations but Pluto on the New Moon and square Uranus and BML is a reminder that we don’t want to build on the ruins of the past. “We first need to clear out, detoxify, cleanse, renew, regenerate or release the past all together– and then we can start to set a new foundation on which to build. “This can play out in relationships, career situations and in the world around us! “The ruler of this lunation is Saturn (he rules Capricorn) and is currently in Sagittarius and during the week leading up to the New Moon he conjoined Venus. “Reality checks as well as serious and perhaps somber assessments of relationships, money situations, our values and self-worth are the focus right now. “Saturn is in square aspect to both Neptune and Chiron- reminding us that we need to reality check ourselves when we are in denial, delusion, or allowing ourselves to be deceived (or perhaps where we are deceiving others?). NEW MOON Blessings to us all! So in tune with this, thank you! It’s so amazing how it all fits together! I have been in this internal turmoil and knew somehow I had to breakthrough. The words on this beautiful message just left me in awe. And to my dazed and confused state of being found out today is the 9th of January of new moon!!!!!!!!!!!!!!!! I am listening to a new language of my heart lately and this message just told my intuition I’m on the right track!! Thank you so much beautiful people. I’m so confused- your title paragraph says the new moon is in Sag, and then it says Capricorn right after. Can you provide some insight? Human, Divinely inspired but not infallible. Did that really confuse you? Really? Thank you for sharing the New Moon Jan 9 ,016 just after midnight. The depth and breadth of these offerings is greatly appreciated. Thank you for your divine insight and counsel. Very much appreciated. Sending love and light. Your sharing gives me good fodder to meditate on and a nice new understanding for the new start I am forced to create.